The Hamilton Watch Company is a brand of the Swatch Group, a Swiss watch company based in Bienne, Switzerland. The Hamilton Watch Company had its genesis as an American watch design and manufacturing company, which incorporated in 1892 and produced its first watch in 1893. After its formation, the Hamilton Watch Company went on to manufacture and market pocket watches and wristwatches, ending American manufacture in 1969. Through a series of mergers and acquisitions, the Hamilton Watch Company became a diversified conglomerate itself and was subsequently integrated into the Swatch group. Today the brand is one of more than twenty watch brands belonging to the Swatch Group, the world’s largest watch manufacturer and marketer. Hamilton succeeded three watch firms manufacturing timepieces in the same facilities in Lancaster, PA, including the Lancaster Watch Company. The precursor to the Hamilton Watch Co., the Lancaster, Pennsylvania based Keystone Standard Watch Co., was started by Abram Bitner in 1886 with the purchase of Lancaster Watch Company’s factory. Keystone manufactured watches featuring a patented “Dust Proof” design that used a small acrylic “window” to cover the only opening in the plate of the movement. Keystone existed until 1891 when the company was sold to Hamilton Watch Company. The Hamilton Watch Company was established in 1892 after Keystone Standard Watch Company was purchased from bankruptcy. During the same year, Aurora Watch Company of Illinois also merged into Keystone. The name of the new company was originally to be “Columbian,” but when it was discovered the Waterbury Watch Company had trademarked that name, a meeting of stock holders was called in November 1892 and a new name selected. The company was named after Andrew Hamilton, a Scottish born attorney who laid out and founded Lancaster, and was the original owner of the Lancaster site on which the factory was situated. During the expansion of the railroads in the U.S., Hamilton maintained over 56% of the market. Railroads purchased all of Hamilton’s production. 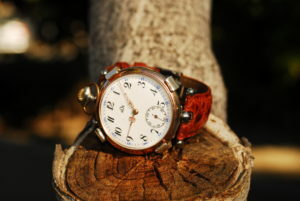 As the market switched from pocket watches to wrist watches after World War I, the company manufactured wrist watches. During World War II, Hamilton retooled its business model to serve the military, dropping its consumer products. Hamilton Watch Company was housed on a 13-acre (53,000 m2) complex in Lancaster. Hamilton eventually took possession of Aurora Watch Company’s machinery shortly after incorporation. The first watch made under the Hamilton name was an 18-size 17-jewel pocket watch in 1893. During Hamilton’s first fifteen years, only two size movements were produced — the 18-size and the smaller 16-size. The company’s first series of pocket watches, the Broadway Limited, was marketed as the “Watch of Railroad Accuracy,” and Hamilton became popular by making accurate railroad watches. Hamilton introduced its first wristwatch in 1917, designed to appeal to men entering World War I and containing the 0-sized 17-jewel 983 movement originally designed for women’s pendent watches. In 1928 Hamilton purchased the Illinois Watch Company for in excess of $5 million from the heirs of John Whitfield Bunn and Jacob Bunn. Some of the most collectible early Hamilton wristwatches include The Oval, The Tonneau, The Rectangular, The Square Enamel, The Coronado, The Piping Rock, The Spur, The Glendale, The Pinehurst, The Langley, The Byrd, The Cambridge, the Barrel “B”, and The Flintridge. Many models came in both solid gold and gold filled cases and, though rare, some wristwatches such as the Grant were made of silver. During World War II, production of consumer watches was stopped, with all watches manufactured being shipped to troops. More than one million watches were sent overseas. The company was extremely successful in producing marine chronometers and deck watches in large numbers to fill the needs of the United States Navy, and other Allied navies as well. The Model 21 Hamilton was built first and had a chain drive fusee, followed by the Model 22. The Model 22 had a traditional main spring, available in a traditional double box and also in a deck watch. The Model 21 and 22 had a two-day power reserve and the movements of both were marked U.S. Navy Bureau of Ships. The model 22 was also used by the U.S. Army and on the back of some it is marked U.S. Army, but all the model 22 movements are marked U.S. Navy Bureau of Ships. The Model 23 was a 16 size pocket watch case with a black dial; despite the pocket watch case, this was a stop watch. The Model 4992b was in a 16 size case, with a black dial. It was used as the pocket watch for U.S. military, featuring a 21 jewel railroad grade movement. In 1951, Hamilton rebuffed a hostile takeover bid by the Benrus watch company. The fallout from the failed takeover action culminated in Hamilton Watch Co. v. Benrus Watch Co. (206 F.2d 738, 740 (2d Cir. 1953)), a Federal proceeding that is considered to be landmark in the realm of Federal anti-trust case law. In 1955, Hamilton provided a “celestial time zone clock, permitting flight-type navigation” for the Astra-Gnome concept of what an automobile would look like in the year 2000. In 1957, Hamilton introduced the world’s first electric watch, the Hamilton Electric 500. It was available in a variety of non-traditional asymmetrical case styles including the Ventura that was designed by Richard Arbib. The watch was worn by Elvis Presley, who also featured it the movie Blue Hawaii. In 1962, Hamilton entered into a joint venture (60% owned by Hamilton) with the Japanese watchmaking firm Ricoh to produce electric watches meant primarily for the Japanese market. The electronic components were produced at Hamilton’s Lancaster factory while production of the mechanical works and final assembly were undertaken in Japan. Although production levels of Hamilton-Ricoh watches were high (over 1000 per month), demand was low and consequently, the Hamilton-Ricoh partnership was unable to compete with the substantial market presence of Seiko. The partnership was dissolved in 1965, with the remaining Hamilton-Ricoh electronic movements (marked “Ricoh 555E”) re-cased as “Vantage” and sold in the U.S. In 1966, Hamilton acquired the Buren Watch Company of Büren an der Aare, Switzerland, including all factories and technologies that had been developed by Buren up to that point. From 1966 to 1969, Hamilton Lancaster and Buren Switzerland were operated as a joint concern, with Hamilton using a number of Swiss movements for their “American” watches and Buren utilizing a number of components manufactured by Hamilton Lancaster. It was during this time that Hamilton started to selectively incorporate the highly innovative Buren Micro-rotor (a.k.a. Micro Rotor/Micro-rotor) movement into small numbers of certain upper tier watches, in addition to their ordinary hand-wind and traditional automatic watches. The Buren (now Hamilton/Buren) Micro-rotor was the first patented automatic wristwatch movement to eliminate the sizable external oscillating weight inherent to most automatic winding watches. Instead, it utilized a much smaller weight that was entirely integrated into the chassis of the movement. This design allowed for a substantially slimmer automatic watch that still retained a center sweep second hand. The Micro-rotor concept was also conceived by Universal Genève for use in their Polerouter series of timepieces during this same time. The official title of “first Micro-rotor movement” is still in dispute among some horology aficionados, even though Buren patented their design in 1954 while Universal Geneve applied for their patent in May 1955. From 1969 to 1972, all new Hamilton watches were produced in Switzerland by Hamilton’s Buren subsidiary. In 1971, the Buren brand was returned to Swiss ownership and by 1972, the Buren-Hamilton partnership was dissolved and the factory liquidated, due to decreased interest and sales of the Hamilton-Buren product. On May 16, 1974, the Hamilton brand was sold to SSIH (subsequently The Swatch Group). In 1971, the Omega & Tissot Holding Company Société Suisse pour l’Industrie Horlogère (SSIH) purchased the Hamilton brand and utilized the Hamilton name for a number of branding efforts, including numerous quartz watches in the 1980s. The Hamilton Watch Division became a subsidiary of HMW. The Hamilton Watch Company changed their name to HMW at the time they sold their Watch division to SSIH. A team led by John Bergey of Hamilton Watch in Lancaster, Pennsylvania developed the Pulsar, the world’s first digital watch. Through the merger of SSIH and ASUAG Groups in 1984, Hamilton became a subsidiary of The Swatch Group.